"Our generals and secretary of defense confirm that Iran is not building nuclear weapons," he said. "We ask Congress to say no to a war on Iran based on faulty intelligence, and to not put our troops in harm's way. A war with Iran would not serve America's interests." Another attendee of the event suggested Israel should abandon its nuclear weapons, and said it was hypocritical to warn against Iran obtaining a nuclear weapon while turning "a blind eye" to Israel. "Frankly, I am opposed to nuclear weaponry in any nation's arsenal," said Rev. Bruce Prescott, an ally of Americans Against the Next War. "As long as the world turns a blind eye to nuclear weapons in Pakistan and Israel, it is hypocritical to be alarmed about the possibility that Iran might acquire them. We need to be working for the nuclear disarmament of all nations." The billboard campaign was featured in a newsletter published by the Peace House Oklahoma City, a "center for education and nonviolent action on issues relating to human rights, economic justice, environmental sustainability, and nonviolence." At the press conference announcing the billboards, Nathaniel Batchelder, director of Peace House, railed against neoconservatives and "elite war cheerleaders" who were "ratcheting up" warmongering against Iran. When asked who specifically was behind the "fear mongering," Batchelder blamed Israel. "Well, we know that Israel is very uncomfortable with the idea that any nation that they believe wishes them ill, would even have a nuclear power plant," he said. "We know there are people inside Israel and inside the United States who believe a military strike is justified right now," Batchelder said. "Because they don't believe Iran should have the capacity to enrich uranium at all." When pressed further on "who are those people," another activist, Katherine Scheirman, named John Bolton, who is now President Trump's national security adviser. "I can think of a couple off the top of my head, number one is John Bolton, the former UN ambassador," she said. "He's been an adamant hawk on Iran." Batchelder also said he was "greatly" concerned that Oklahomans "don't have accurate information" because they listen to conservative talk radio and "shock jocks" on Fox News. "It seems as though they can't wait to have a military confrontation with Iran," he said. Peace House later advocated for improving relations with Iran, arguing the Islamic Republic's pursuit of nuclear technology was "most likely all for peaceful electrical and medical needs." Over the weekend a senior Iranian official claimed to have the formula for how to produce a nuclear bomb, and celebrated the 40th anniversary of the Islamic revolution on Monday with chants of "death to America" and "death to Israel." Jalal Farzaneh recently defended Omar on a public post to his Facebook page. He posted an article written by "The Electronic Intifada," entitled, "Ilhan Omar under attack for telling truth about Israel lobby." "Minnesota Congresswoman Ilhan Omar is under fierce attack from Chelsea Clinton and other Republican and Democratic establishment figures for voicing a fundamental truth: much of Congress is muzzled when it comes to Israel by the powerful lobby group AIPAC," the article states. He also shared a video by "Rebel HQ" claiming Omar was being "smeared" for her "completely logical comments about how much influence the Israel lobby has on our Congress." "So what did [Omar] say that was so wrong?" the woman in the video asks. 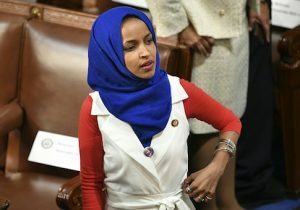 Omar received bipartisan criticism for spreading anti-Semitism on Twitter, when she suggested Republican support for Israel was "all about the Benjamins baby." She then responded to criticism that she was tweeting an "anti-Semitic trope," by tweeting "AIPAC!" David Duke defended her tweets. After her election to Congress, Omar revealed her support of the movement to boycott Israel. She previously called Israel "evil," and accused the American ally and only democracy in the Middle East of "hypnotizing the world." Farzaneh has also shared videos on Facebook of "A 2017 view from Iranian foreign minister Javad Zarif," and another titled, "Old lady arrives home finds Jewish settlers have stolen her house #Palestine." Home Creations has donated $370,596 to political campaigns since 2002, the vast majority of which went to Democrats ($311,096). The company also donated to former congressman Keith Ellison. Home Creations did not respond to request for comment. The Farzanehs have also donated $4 million to the University of Oklahoma international studies program, and funded an Iranian and Persian Gulf studies program at Oklahoma State University.